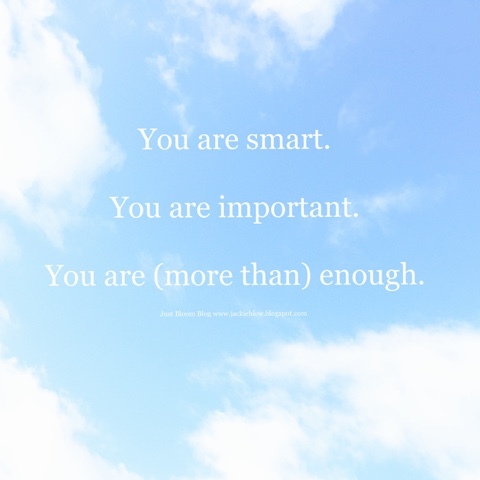 You are smart, important and (more than) enough. For as long as humans have been alive, there have been judgments made about one another. In my experience, most of the judgments people make are based on material possessions or outward appearances as opposed to character or personal information. In elementary and middle school, it was about who had the best name brands. In high school, it was about who was the prettiest and most stylish. In college, it was about who was the skinniest. It wasn't until law school that I felt intelligence was really even a factor. Now that I'm a mom, I am more mindful of what I say. For instance, I don't curse or call myself "fat" (as much). I constantly tell my baby boy he is loved and he is smart. I just think it's important to hear those things. These days, much of our lives are now displayed on social media. And that invites comparison and critique. Well apparently, National Compliment Day occurred this week, which was a joy to see amid this controversial political time. On Twitter, I came across this National Compliment Day poll in which each person voted for a compliment about him or herself. Of the options, I chose "I am important." I was pleased to see that most people did, too. More than beautiful, people seemingly valued their worth. You are (more than) enough. Don't let anyone tell you differently. So take that new job offer. Go on the first date. Do that challenging workout. Pamper yourself. Be good to yourself. Believe in yourself. I love this! You are an amazing lady my friend!